BRISTOL - Mayor Ellen Zoppo-Sassu told the City Council Tuesday that an American Job Center office will be opening in the city. The mayor said that the office will be located in the Tunxis@Bristol Center. 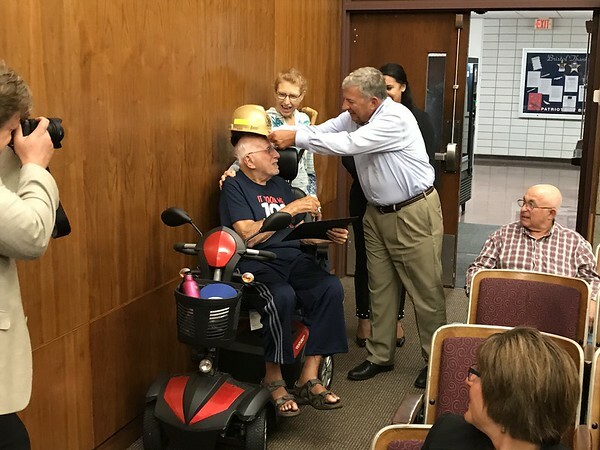 The council, along with Chris Boyle, John Lodovico and Tiffany Morrissey, who oversees the Bristol Hospital downtown construction project, also presented 101-year-old resident Orville Veith with All Heart recognition and a hard hat from the site for his birthday. “Mr. Veith resides at the Riverview Apartments on Laurel Street and since the construction project on Centre Square began he has driven his motorized chair down to the corner of North Main and Laurel to spend his afternoons watching the activity,” said Zoppo-Sassu. Veith was dubbed the “clerk of the works” in a proclamation by the mayor. Veith was born Sept. 9 1917, in Warren County, Missouri, and has lived in Bristol since 2012. He served in World War II in the U.S. and Germany and lived in Bloomfield while he worked for the U.S. Postal Service. He was married to Gloria Barber Vieth for 69 years and has three children, seven grandchildren and two great-grandchildren. The nonprofit showcase portion of the meeting focused on the Bristol Businesses Education Foundation. The Foundation gives out mini-grants to teachers and will hold a trivia night fundraiser on Oct. 19 at 6 p.m. at DoubleTree by Hilton at 42 Century Drive. Tickets are $35. Sarah Mitchell, community communications coordinator with the Bristol Business Education Foundation, explained that the organization is a partnership between the Bristol Chamber of Commerce, the Bristol Board of Education and the community. “Last year we awarded more than $17,000,” she said. Police Chief Brian Gould also spoke about a recent rash of thefts of tires and rims from vehicles. The incidents, he said, occurred before daylight and were likely completed in 10 minutes of less. They happened in large apartment complexes and in driveways. He said that 24 incidents have been reported since April 9, with four called in Monday night. “Lock your vehicles and garages, do not leave valuables in plain view, enable security features and always park in well-lit areas,” said Gould. The Council later approved Tom Marra for the Zoning Commission, Lance Washington for the Youth Commission and Tammy Kelly for the Inland Wetlands Commission. Just before the meeting, the council played a video of images from the aftermath of the 9/11 attacks set to Disturbed’s cover of “The Sound of Silence,” in remembrance of the lives lost that day. Gould was asked to led the Pledge of Allegiance during the meeting. Posted in The Bristol Press, Bristol on Tuesday, 11 September 2018 21:45. Updated: Tuesday, 11 September 2018 21:48.